By far the largest menu of melodies and other sounds. Helps me tune out the noisy bachelor mockingbirds at night or just enjoy a trip to the beach. Have used this for years. There is no better app out there! Most of the sounds i dont use but i love the way i can have multiple sounds at once. OLD REVIEW: Huge variety of sounds, both natural and musical, and the ability to make custom mixes of just what you like make this program well worth it. We have a nature sounds generator from Brookstone that cost us well over $100 and it doesn't sound as good or have as much versatility. New review: Half of the sounds (mainly popular ones) that used to be free with the app but are now only available for an obnoxious subscription price? Is this supposed to be relaxing? No thanks. 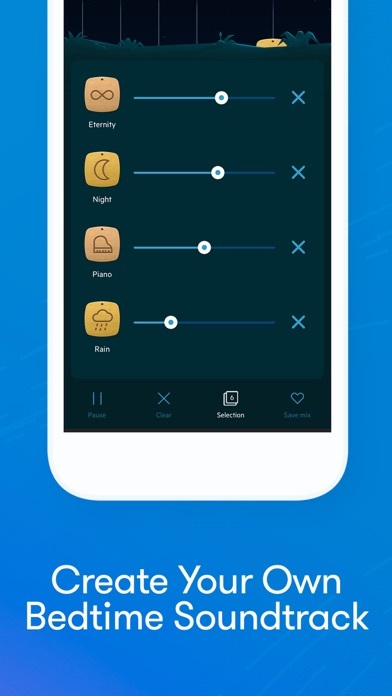 Wonderful app that literally saved my sanity from an attack of tinnitus. With this app playing all day at work and as I slept at night, I learned to train myself to virtually ignore the tinnitus within two weeks. So thankful for this app! Couldn't get through my work day without it! Can not believe that there are in app purchases in an app that I already paid for. After the updates from when I first got it, the guided meditation and cool features are now a monthly fee. Stupid. Greedy. I enjoy this app especially when I travel, I have to sleep with some kind of white noise and this app does the trick. However I can’t get the app to save my mixes, I have to pick them every time I open the app. Very easy to use, suits my needs. Lots of sounds. I paid for this app, but now i have to buy a subscription just like people who DIDN’T pay for the app! greedy developer; huge rip-off! This app is so much better than any other apps I’ve ever used and it is so good I love it! Most of the items becomes inaccessible after the update. With the update are ads and locked unless you purchase. Per ipnos, can’t revert to previous. I have insomnia and this app is a dream come true! I use it all throughout the day, even! 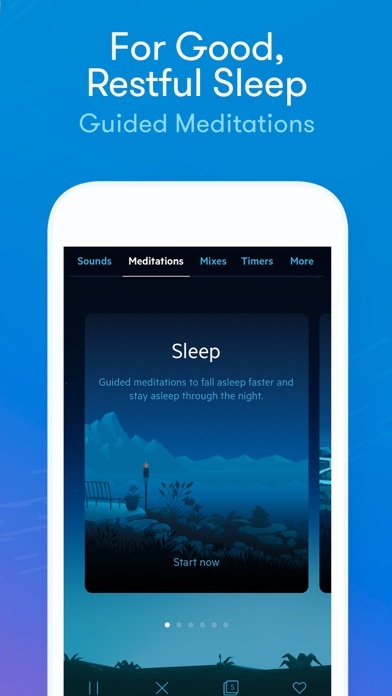 Using Relax Melodies has put my sleep issues behind me, I have no more problems falling asleep and it appears I wake better rested. Don’t want yo think what I’d do without it. This is a wonderful app. I use it daily for sleep and relaxation. This app is so simple to use. The sound quality is fantastic. Best of all, it has something for everyone so I use it for myself and to get my kiddos to fall asleep. Airplay should always be available on any audio app. Such a good app to be rendered worthless without the ability to send to your home speakers. (Great app!! Love the choices and I use it every night). This was my review- Now—- I purchased it because I used it all the time- don’t do it! Nothing different as they claim! It’s the same - and I did not need to spend $20!! Yes $20. I still don’t have access to over half of the sounds or meditations! I emailed the developer and they will not refund! They say I need to go through Apple. So I will try. Do not spend any money! The app is fine and works fine with out spending any money! Waste of $20! Best sleep app out there! Use it every day and it works great! Great night sound machine for kids to sleep to. I’ve had this app for a long time and I enjoy the variety of options and the customization you can do to create your ideal sound. I use this app almost every night. I turn it on, open my book, and I’m asleep before the timer dims the sound. I’ve been using this app for a few years now... it never gets old. I mean, how does the sound of the ocean and peepers get old? I recommend it to all my friends. Always HIGHLY recommended! Also, I spent money to upgrade and it was somewhat worth it. I do think the developers should allow their basic listeners to try out the new sounds or they should be able to add sounds as they wish for .99 - just a thought! I’ve been a fan of the series for a long number of years. The music, meditations, and ambient sounds help me get into a state of calm that is usually hard to attain throughout my busy workday so when I listen to the stuff on these apps I naturally fall asleep. Everything is super calming and if you’re emotional like me, you’d feel closer to these contents. By Charlie S. O. S.
Create your own vibe to bring you into alignment with a state of relaxation. ...the volume scales for the sounds are EXTREMELY loud. Please make the sounds have a more balanced volume scale. A must for putting my daughter to sleep! This app is a lifesaver. I didn't even need the extended version of this app but bought it because I loved it so much. Now that I have the paid version, i love it even more than i knew was possible! I love this app and I use it every day. It has a huge selection of sounds that are very relaxing. The sounds are high quality & don't sound loopy, and the interface gives its users great control over mixing and matching their own preference of soundscapes. I love that. And you can save your favorite mixes. 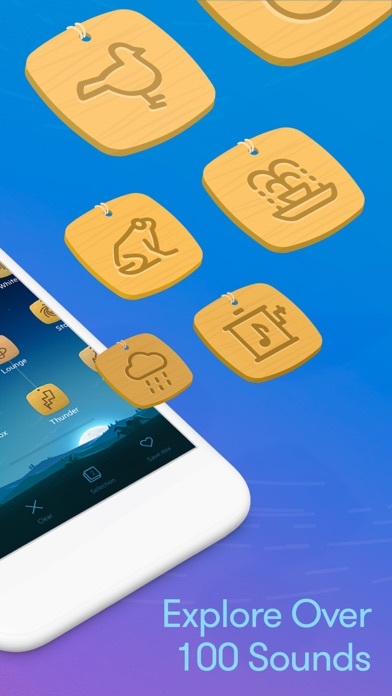 I also like that they continue to add new sounds & features with their updates, so the app just keeps expanding and getting better which is fairly rare for a lot of apps these days; they just do one thing, but this app keeps growing. So many things I love about this app. I highly recommend buying the premium version. It's totally worth it, it's a high quality app. 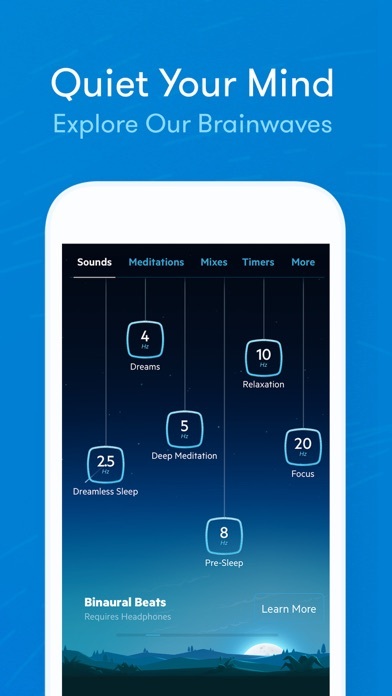 It even has guided meditation now - sometimes the Alram clock will not work for me. yikes! That's dangerous, so I just stopped using the alarm feature, which is a bummer because they have really great, gentle sounds to wake up to. But on the upside, they updated the app to mute when the iOS alarm clock rings, and when u hit snooze, the app unmutes and continues your sounds. That's great. 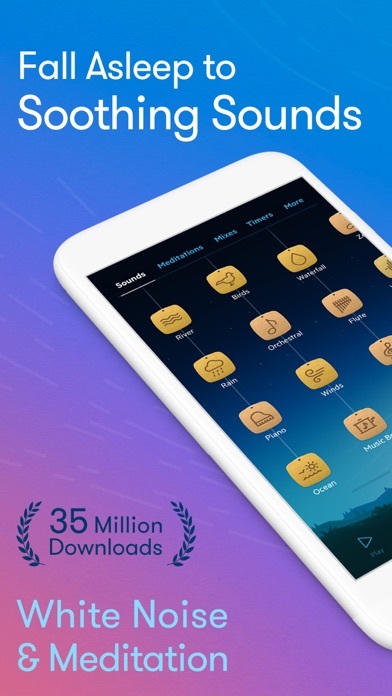 Buy this app. Worth it! This app works great and I use it every night..... There are many choices of sounds which can be played together -- and you're able to control the volume of each sound separately... The iOS version also allows you to use your own music files and incorporate them into your relaxation mix... I'm not sure if the Android version has that capability though... Anyhow, I highly recommend this app... I've been using it for over 5 years now... Also, if you have deleted the app and want to reinstall it, your saved mixes come right back too... In addition, if you have more than 1 iOS device and use this app, your saved mixes automatically sync to each of your devices (as long as the Apple ID is the same for each device). I have used this app from day one in my office to drowned out noise. It's worked like a charm!!! Love this app! My entire family uses it. How do I sleep when I'm somewhere new? How do I study when the neighbors are having a party? How do I block out the noise on public transit? This. I have used this app for the past few years for yoga, meditation, and bedtime. I highly recommend it. I mostly use it to fall asleep, but on occasion, I enjoy listening at work when I’m really stressed out and need some soothing sounds to calm and relax me.